SBMI is proud to celebrate its 20th anniversary on April 20, 2017! SBMI has evolved and undergone many positive changes over the past 20 years…much like the field of biomedical informatics which has grown and advanced, too. 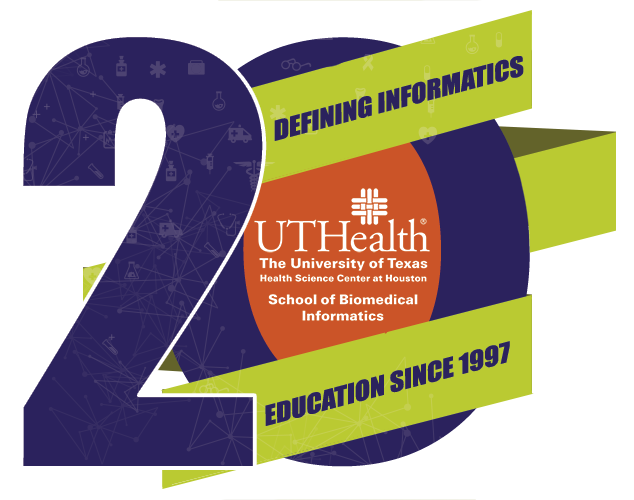 SBMI has spent the past 20 years outlining, defining and refining education in biomedical informatics, thanks to you. Without the faculty, alumni, students and staff, SBMI could not reach this achievement and the school would like to invite you to celebrate this milestone. Visit the SBMI 20th Anniversary webpage to see a timeline of the school’s history and to share your favorite SBMI memories. Everyone is welcome to attend Connect 2017 on May 1 (4:30 p.m. in IMM Atrium - 1825 Pressler Street, 77030) to celebrate the school’s anniversary as well. A research article authored by SBMI Alumnus Jianbo Lei, M.D., Ph.D., M.S., M.A. and co-authored by Professor Dean Sittig, Ph.D. was recently published in the Journal of Healthcare Engineering. Lei currently works for the Center for Medical Informatics at Peking University in Beijing. Join us on May 1 for Connect 2017 where current students will present their spring research projects. SBMI’s annual alumni panel will take place during the event as well and will include three SBMI graduates: Preston Aycox, Pharm.D., M.S. (Tenet Healthcare), Shree Dhavale, M.S. (Greater Houston Healthconnect) and Sahiti Myneni, Ph.D., M.S.E. (UTHealth SBMI). For more information, visit our Connect 2017 website. The Center for Precision Health (CPH), a joint venture between SBMI and the School of Public Health (SPH), held its inaugural Precision Medicine Day on April 13. Over 100 attendees were on hand for the event. It included sessions led by UTHealth faculty members and other subject matter experts in the field of precision medicine, 25 student research posters and a keynote speech by Yves Lussier, M.D., the associate vice president for Health Sciences and chief knowledge officer at the University of Arizona. View photos from the event online or visit the Precision Medicine Day website to see the full list of sessions and activities that took place. The Gulf Coast Consortia (GCC) is hosting a Rigor and Reproducibility Workshop on June 9. The interactive workshop will include organizers and discussion facilitators from all GCC institutions and cover topics including Experimental Design (basic science, population science, and big data science, cell assays, antibodies, human, and computational studies, etc. ), Analysis and Statistics, Data Management, and Publication and Reporting. A certificate of completion will be provided. The workshop will be from 9 a.m. to 5 p.m. at Rice University’s Bioscience Research Collaborative Auditorium (6500 Main Street, MS-650). Students and postdocs are encouraged to attend, and all are welcome. Space is limited so register online as soon as possible, if you plan to attend. SBMI Professor Lex Frieden, M.A. gave the keynote address for the Houston Community College (HCC) VAST Academy 25th anniversary celebration. The academy provides post-secondary transition programs and comprehensive support services for students with intellectual and developmental disabilities. A news story recognizing the program’s anniversary was published in HCC’s The Egalitarian.